About: A self proclaimed “Passionate Canadian Girl”, Denise Jones-Chu grew up all over British Columbia. It wasn’t until being reintroduced to ceramics that she started to discover the endless possibilities of buttons. She now offers these unique, handmade, little pieces of art under the name ‘Hello Beautiful Buttons’. As a well established artist in BC and working in Vancouver, what do you feel is needed in terms of art in our region? I think more affordable venues are needed with exciting multi media interests would be great for Arts and for the city of Vancouver. Get the public more aware of the quality of art in our City by incorporating quality art & entertainment into every city event! Your work is unique and also rare in terms of artists making ceramic fashion accessories. 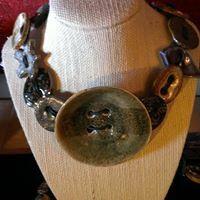 What inspired you to start making ceramic buttons? Making Ceramic buttons started out as a way to experiment with glazes! Then I started to play with shapes, & texture. I started changing all the buttons on my clothing and seeing how the buttons transformed each piece of clothing and how they (the buttons) created a whole new look! Here I am over 6 years later still getting excited by the endless possibilities! Fashion and art are both really important elements that compliment one another in your work. 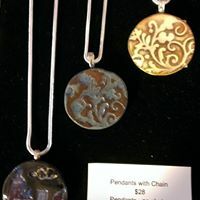 How do you draw inspiration for making wearable art pieces? Do you have any upcoming Spring/Summer fashion trend tips? Ladies, layer interesting combos such as a tailored look with a bit of lace under a shirt or a skirt! Add a little blue, purple or pink to your wardrobe to be “cool” this coming season! You talk about re-purposing clothing or home décor such as jackets or blinds with your buttons to revamp and add new life to existing pieces. What are some of your most interesting revamping or upcycled projects that you have done? Vancouver is well known for its eco-friendly and green lifestyle. Do you think that our area has inspired your work? I love that Vancouver as a city cares about keeping things healthy for us all! Certainly I am inspired by that! Personally, I have always enjoyed the thrill “making something out of nothing” and it feels great to live in an area that supports this kind of mindset! In the past, you have taught varied forms of art. Do you believe that creativity can be taught or do think it is innate? I think we are all born with creativity, it just doesn’t present itself the same way in each individual. In me it shows in my varied visual art, in others it might show in their acting, organization skills or in running a business for example. Having said that, I believe that if a person has a desire they can develop their creativity as well as their skills in any area, even in visual art forms. We won’t all end up being as noted as Matisse or Van Gogh but we might be surprised at what we can achieve! This is your first time exhibiting at Art World Expo. What are you looking forward to the most at the event this year? I am looking forward to the whole experience, the energy and the sense of fun! Your buttons are in dozens of stores in Canada and the US. What advice would you give emerging artists on how to approach retailers to sell hand made pieces? One of the main things I have gotten feedback from retailers is how thrilled they are by my marketing props such as signage and packaging. Make it easy for the stores to sell your product! Have a variety of at least 2 or 3 ways for retailers to present your art/product the way you would like to see it presented. Where can we find your pieces in Vancouver?